Cleric of Urgathoa (60088) - multiple pieces? 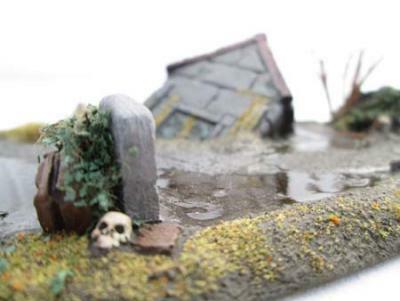 The unpainted pic here on the Reaper site shows a pretty clear open socket, even with the scythe sticking out of it. There are various reasons this might be happening. It's cold and moist in many locations right now. Maybe that is affecting the spray. But whatever the cause, one thing I do when I get a similar effect, it to brush on some Vallejo Matte Medium. Not Matte sealer, though that might also do the trick. But I find when all else fails, the Matte Medium takes the shine off. It isn't meant to be a sealer, but since you already have something on there, it should be fine. It dries clear. I do a lot of weird fiction in our games, and specifically have run a long-time game set in Silent Hill, with Mythos fragments thrown in. I find that it's both scarier and less convoluted when I do not overthink these things, or stick too specifically to canon as provided in rule/sourcebooks, etc. Continuity is always important to some degree, but keep in mind that Lovecraft himself considered all of this stuff to be best when re-interpreted, scattershot, inconsistent, etc. It adds to the mystery and the chaos of the thing. All that said, the first thing that comes to my mind, is that Mythos creatures tend to dream and to think in the abstract, and any consideration they might have in passing for us mere mortals can skew our reality or our perception of it pretty severely. I think you could just get away with the backstory character somehow popping up momentarily and incidentally on Nyarlathotep's radar. Any intense emotions, lingering guilt, whatever the character is subconsciously experiencing, would be enough for proximity to an Eldritch being to propel him (and companions) to the other plane, etc. In our games, it is generally understood that the action is mostly taking place in a demiplane of the characters' unconscious design, populated with clues and reminders of whatever they are trying to repress. Simple proximity to the power that enables this shift, is enough. It's like not knowing you are psychic, until you come within range of a powerful battery, at which point your demons are activated against your will. 1898 Miniatures has a Rough Rider Teddy Roosevelt. Gringo 40s has two of them (one is mounted). Black Tree made a Lincoln in an old Dr. Who line. Ainsty Castings did a Vampire Hunter Lincoln. Perry Miniatures had a Lincoln. I seem to remember a Grant in an old set somewhere... You just have to do a search for these things. They are out there. Best bet is to search specifically for a President by name, and include "28mm" and "miniature" in your searches. But was it on fire? That might do something. This idea is so totally stealable great! I will be stealing praising this idea in the days ahead. This gives me a few stealable good ideas of my own. Thanks for posting this! I've never had any trouble using an actual speed-variable electric drill on minis. I realize this is not for everybody, but I am always surprised that more people do not simply use the most obvious tool. With practice, you may find you are able to drill even very small, fragile parts. I suppose there's an art to it, but we are all artists of kind here, yes? I have a Dremel, of course, which I use for fifty other techniques. I never had any luck using it for drilling. It's either a pin vice or an actual drill for me. Say... those are pretty cool. I've always pronounced it PEAR-ee-tun, similar to how TaleSpinner does, but with the accent on the first syllable. Both Greek and Latin were spoken widely - very widely - and so pronunciation did vary, and at least in the case of Latin, the sentence form and structure was very loose. That said, I am not sure this was a true mythological creature from antiquity. I believe Jorge Luis Borges invented it, but claimed he found it in an old manuscript. Not sure if anybody has ever seen said manuscript. Sometimes I like to turn the shipping containers into bunkers or other little outposty things. I got some kind of not-great pics this time. They're taken in various stages, so flock missing in some/not in others, and some areas do not appear painted here, that were painted later. EDIT: Hmmm.... I stuck these here because they started out as Reaper (models), but now I wonder if this should be in the terrain section. Kudos to you for catching the logo! I made up stencils in styrene for a few different logos, including Stark Industries, CyberDyne, and InGen. Thank you! It's worse than you think. Those "space bunnies" are Robbie Rabbits from Silent Hill. Shhhh... they're watching us. I blame that IMEF trooper in the first few pics. He claimed he was just there to show off scale, but he had a suspicious look about him. There are plastic Bonsai trees on eBay in the $10 range, and I think some of them come with free shipping. They would end up in the Huge to Colossal range, unless you trim them down, but I have seen some with some pretty nice texture and a good selection of branches. Michaels has these long styrofoam cylinders in three-packs that you can get pretty cheap with their weekly coupons. I use those sometimes to quickly make thick-trunked, giant trees of the Redwood or Sequoia varieties. It's pretty easy to carve a bark texture into them, which can then be puttied up with wood filler or spackle to fill in the air pockets and add detail. With just a few well-placed wire branches you could get pretty much any sized treant in a hurry. Awesome - that exposed leg adds a lot of character to the piece. Very nice. Oddball question: I notice two different styles of bases, a 30mm round lip and a flat 40mm. Does twisted have loose rules for basing or space, or was that just an aesthetic choice? Rain falls hard Burns dry... a dream Or a song... that hits you so hard... Filling you up.... Suddenly gone. Others have already touched on the bog/peat (European) mummy. Which is a fun idea. Just to throw an alternative out there, there are Mesoamerican mummies, too, usually found in dry caves (one famous one well preserved in a sitting position), which were thought to be sacrifices of a kind and have a spooky element all their own. With a little work you could transport one to a jungle swamp setting, where the swamp has encroached on the mummy's resting place. Super glue and baking soda? Yeah, this technique has long been a go-to for creating rust and similar textures. That is, until liquid greenstuff came along and made it much easier.